Felicitas FieldSolver 3D is a powerful fully integrated simulation system for designing antennas, verifying shielding or optimizing wired UHF communications. The simulation engine is based on state-of-the art FDTD (Finite Difference Time Domain) algorithms. The implementation is highly optimized and takes full advantage of modern multi-core workstations. Even large simulations are done quickly on well equipped personal computers. FieldSolver 3D is a full 3D electromagnetic wave solver. Therefore any task which requires deep insight into electromagnetic wave propagation can be tackled. The most important features of antennas are there radiation pattern, that is the gain in any direction and the matching, that is the input impedance at all frequencies of interest. FieldSolver 3D is able to determine both in a single simulation run. A cubic volume is created which covers the complete antenna. From the field on the surface of that volume, the far field is calculated and visualized in 3D. The advantage of that approach is that the simulation volume is comparatively small and can be simulated with high resolution. A sub grid is created which covers the radiation structures. The sub grid has a higher simulation resolution compared to the main grid in both space and time. The main grid is used to simulate the far field of the antenna. This unique feature of FieldSolver 3D allows to simulate the antenna with high resolution and to retrieve the far field directly from the simulation. With todays frequencies of several 100MHz or even GHz, the layout plays a key role for a successful design. FieldSolver 3D is able to import layout data and simulate the behavior of vias and tracks. The properties of Standard Microstrip and Stripline transmission lines can today be calculated from their geometries. But any discontinuity is beyond the scope of closed-form formulas. The influence of vias to high speed signals can be simulated and visualized. This allows the designer to optimize the geometry of the vias (hole and pad diameters, feeding stub, placement). Losses are minimized and margins maximized. In many high-speed designs the connectors are the critical parts. They represent a discontinuity for the signal path and can be the cause for radiation. FieldSolver 3D imports 3D data from the vendor of the connector and is able to simulate them together with the geometry of the feeding tracks. Reflections and can be visualized and root problems can be identified and rectified. Electromagnetic interference can occur within a device or between devices. FieldSolver 3D can simulate the way how an aggressor signals couples into a victim. The designer gets deep insight into the mechanism involved and is able to create specific means for rectifying the problem. The success of the modifications can be verified in another simulation run. With a full 3D simulation, it is possible to identify the reason for unintended radiation of a device or the reason for sensibility to certain interfering frequencies. 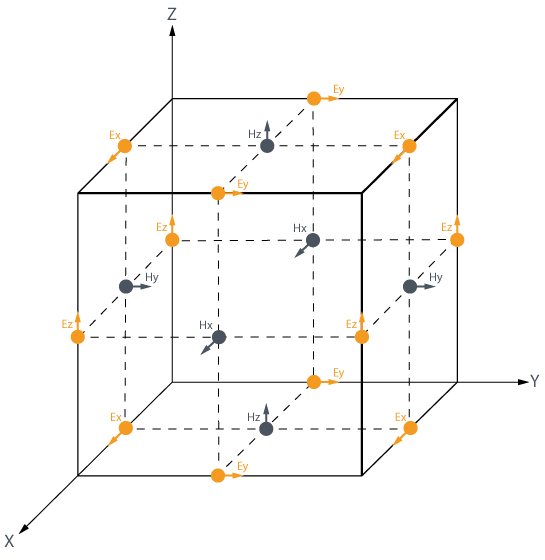 ρm : free magnetic charge density (Wb/m³ ). The simulation volume is build up in a special grid proposed by Kane Yee back in 1966 (“Yee Grid”). That grid holds the components of the E and H field (Ex, Ey, Ez, Hx, Hy, Hz) in different spatial locations. It allows to compute the partial derivations required to update the field very efficiently.